If the photographs and information on the site bring back any memories about Great Yarmouth, please click on the link to 'add a comment' at the bottom of each page, to add your information. 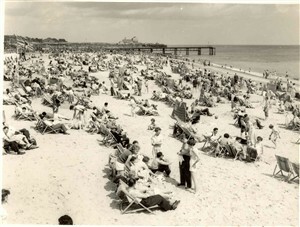 For example, maybe this photograph of Yarmouth beach packed with holiday makers brings back some memories of holidays of your own. This page was added by Laura Matthews on 21/03/2007. What a treat your web site is. I have been coming to your county since I was 15yrs old I am now 57yrs and have a caravan at Burgh Hall which I will retire to. A wonderful county and lovely people congratulations on a lovely web site. I spent many summers at Great Yarmouth during the late 1940's to mid fifties and have lots of memories of the town. I am now 64 living in Florida. Very interesting site with plenty of archive photos, but as a seaside town suprisingly little on how visitors travelled there at the height of the British Seaside Holiday i.e by train and motor bus. I thought the resort owed its very existence to the railway! I was doing a little search of the web and I came across this site, my dad is a David Nutman and he has a younger Brother by the name of Ridley Nutman they were both sons of Dennis Nutman from Dovercourt (not yet sure where he was from originally) - is there any relation to this family?? I found this site by accident looking for some pictures of Gt Yarmouth. My husband was a bookbinder apprentice at John Buckles Printers. Great site and I will be a regular reader. I found the website the same way as you --- it's very interesting. Born in England --- I lived in West Australia for 10yrs before moving to the U.S. Are you an Aussie ? I remember John Buckles. My husband was a Printer before he died 11yrs ago. He was American --- & we met here in Sacramento. I think it's great that I can meet up with old friends via this website. I also like to see the photos of Yarmouth & Gorleston how things have changed over the years. Have a Happy New Year. Molly Yow January 12 - 2010. Hi there, it is exactly one year after my visit to Great Yarmouth on my trip to the UK. Great Yarmouth just like its name, it is a great place, nice people. I wished I will visit it again. Please accept the best wishes to you all there from a Chinese guy. Researching Staff family of Great Yarmouth, anybody got any information ? Some relatives worked in the Silk Factory and lived in the Rows. My Grandmother used to live at 5 Dickies building, South Market Road, Great Yarmouth. Her maiden name was Edith Fulcher Dye and she married George Staff. What a wonderful website you have put toogether, why is it that one finds such an interesting document as life is entering the twilight zone. I read with interest the items on the`53`floods that I have many memories of, and was wondering if you have recollections of the`47`freeze-in.